Al Bello/Getty ImagesBill Belichick and Tom Brady. 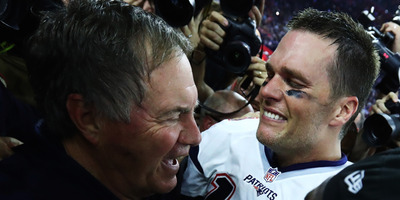 When Tom Brady and Bill Belichick are in the Super Bowl, it’s a virtual lock to be a great game. Among the other 44 Super Bowls, just 11 were such close games. When the Bill Belichick- and Tom Brady-led New England Patriots line up in a Super Bowl, it’s virtually guaranteed that fans are in for a classic. With Belichick and Brady at the helm, New England has managed to make it to the big game so much that some fans are experiencing Patriots fatigue. At the same time, the Patriots have also helped fans forget that the Super Bowl has tended to feature some historically awful games. Brady and Belichick continued a trend that runs in the face of Super Bowl history in their 41-33 loss to the Philadelphia Eagles on Sunday. Each of their eight Super Bowl trips have ended in one-possession victories or defeats. Just 11, or 25%, of the other 44 Super Bowls have ended with such close scores. In other words, when Brady and Belichick are leading New England to the Super Bowl, the game has never disappointed. When they have not, you’ve got a one in four chance of seeing a down-to-the-wire football game. And, of course, the back-and-forth slugfest against the Eagles on Sunday. Sunday’s game also happened to be the largest point differential in any of those eight Super Bowls, with the Eagles winning by eight. Four of those games ended with a three-point differential, while another two were decided by four points. The average point spread in a Brady/Belichick Super Bowl is just 4.25 points. The average differential in a non-Brady-Belichick Super Bowl? A whopping 15.8 points, almost a three-possession difference. In the eight Patriots Super Bowls under Brady and Belichick, they have scored 202 points. Their opponents: 198. The Patriots have been dogged by scandals and controversy during the time. The so-called Spygate and Deflategate controversies loomed over some of their championship runs, while a big story this season involved a catch that was overturned in the Patriots’ favour during a dramatic game against the Steelers. But while the Patriots have become equally divisive as they are successful, even their greatest detractors can’t deny that the Patriots made “America’s Game” much more enjoyable.